Vegtoberfest is the UK's first 100% vegan Oktoberfest taking place in Camden Town. Launching on Saturday 6th October at Camden’s exciting new venue Fest, Vegtoberfest is the UK's first vegan Oktoberfest celebration. The Bavarian themed beer festival will couple the merry traditions of Oktoberfest with a modern twist, vegan friendly beers, wines and street food. Oktoberfest is a beer festival first and foremost and Vegtoberfest is just that. Vegan-friendly Bavarian beers such as Spaten and Lowenbrau will sit alongside a handful of local vegan craft ales including a special Oktoberfest brew from Camden Town Brewery, while vegan wines, mulled wine and hot and cold cocktails will also be available. 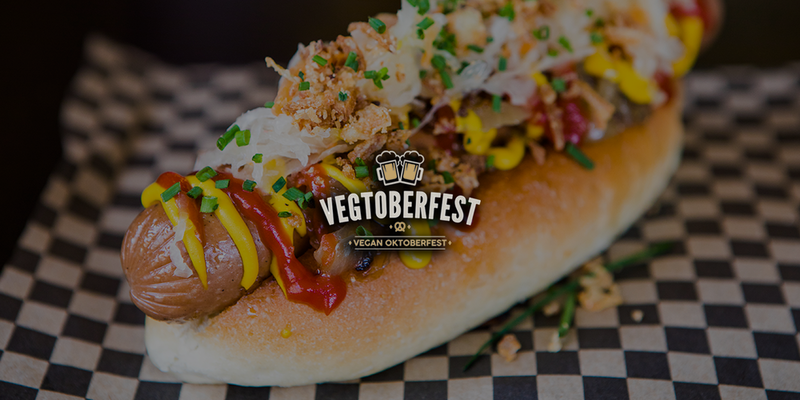 It wouldn't be an Oktoberfest celebration without Bratwurst so Vegtoberfest have drafted in Camden’s leading vegan street food specialists Rudy’s Dirty Vegan Diner. They will be serving 100% vegan, Bavarian Wiesswurst, Bratwurst and Bockwurst sausages with all the usual trimmings. They’ll also be serving their legendary ‘Gooey-Crispy-Fried Vegan Mozzarella Sticks’ and loaded fries too. Vegtoberfest will also make use of Fest Roof Garden's wood-fired pizza oven where a selection of vegan pizzas with Bavarian themes will be served. Fest Camden's main room will be transformed into a Bavarian beer hall where guests can enjoy their 'steins' while live music from the amazing Whale of a Time party band, magic, comedy and DJs will provide the entertainment on stage. Guests will enjoy food and drink from the roof garden with views over Camden Stables Market and groups can also book one of the venues famous Party Stables. At Oktoberfest the main attraction is food and booze and at Vegtoberfest the same applies. It wouldn't be an Oktoberfest celebration without Bratwurst so Vegtoberfest have drafted in Camden’s leading vegan street food specialists Rudy’s Dirty Vegan Diner. They will be serving 100% vegan, Bavarian Wiesswurst, Bratwurst and Bockwurst sausages with all the usual trimmings. They’ll also be serving their legendary ‘Gooey-Crispy-Fried Vegan Mozzarella Sticks’ and loaded fries too. Vegtoberfest will also make use of Fest Roof Garden's wood-fired pizza oven where a selection of vegan pizzas with Bavarian themes will be served. Gluten free bases are available - please request this during your order. Authentic pretzels will also be available. Whale of a Time is a party starting 7 piece live band with an unrivalled funk, soul and pop repertoire. The musicians have played the most prestigious venues in the country from The Royal Albert Hall to Ronnie Scotts Jazz club and they guarantee Vegtoberfest will be rocking all day long. Can't find the information you're looking for? Please get in touch with us at hello@vegtoberfest.co.uk or fill out the contact form below.